Now in its 15th year, Tiki Kon is a weekend celebration of exotic tropical destinations and the Tiki bars, cocktails, art, music and fashions they inspire. It looks like the Terrible Tiki is all ready to go. Come join him for a great weekend getaway full of fun and adventure. So grab a cocktail, just don’t forget to visit us in The Island Marketplace (FREE, open to the public) Saturday, July 1 between 11:00 AM – 4:30 PM located in the Red Lion Grand Ballroom, West Salon Red Lion on the River (Jantzen Beach) 909 N Hayden Island Dr, Portland, OR 97217 to check out all of our Vintage Inspired Neon Tiki Art Pieces. 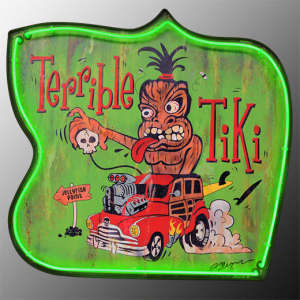 Best you mind your Mai Tai’s or Terrible Tiki could be your ride home.